Nature Birch Trees Watercolor Art Woodland Birch Woods Forest Original Painting by Laurie Rohner. 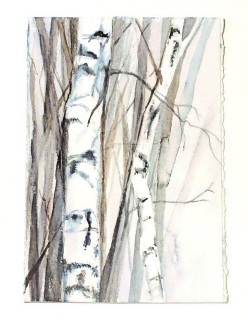 Original nature art watercolor painting Birch Trees is an original artwork for Between The Weeds by Laurie Rohner. The illustration allows you to imagine yourself standing on a brisk winter day or a misty morning in a woodland wood forest of birch tree landscape in early spring. Birch trees are an absolute favorite tree of mine, maybe they are yours too. Image size is 5 x 7.5 inches.